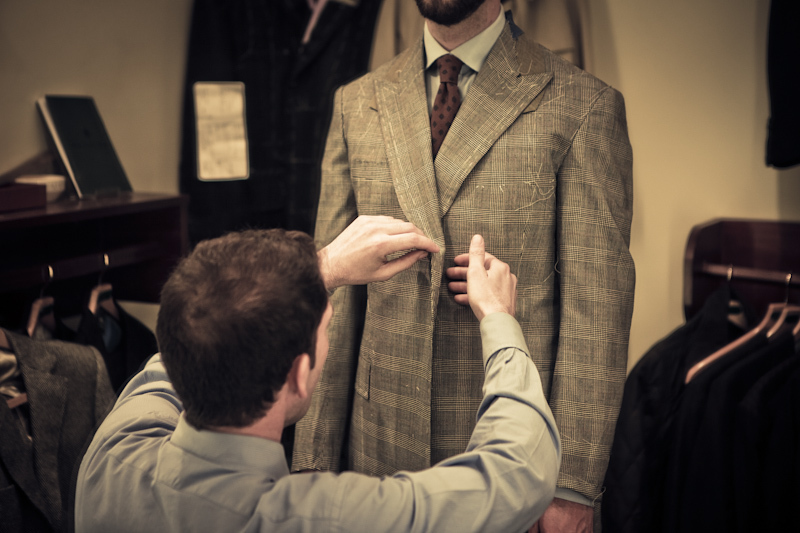 This week was the second, forward fitting for this Henry Poole suit. The shape at the back is much improved since Craig and Alex ripped it apart last time – a nice compromise between hiding the shape of my back and highlighting my seat with too sculpted a line. The shape through the waist is retained, however, by taking that excess cloth out of the foreparts. Although the chest is cleaner than before, it still needs a little adjusting. You can see how it is catching under the arms on both sides. The chest will be taken in a little further and the shoulders picked up to remove this – indeed, Craig decided to increase the size of the shoulder pad slightly, something that does my sloping shoulders no harm at all. We now have the pockets in and the Henry Poole burgundy lining, which matches the overcheck on the cloth. 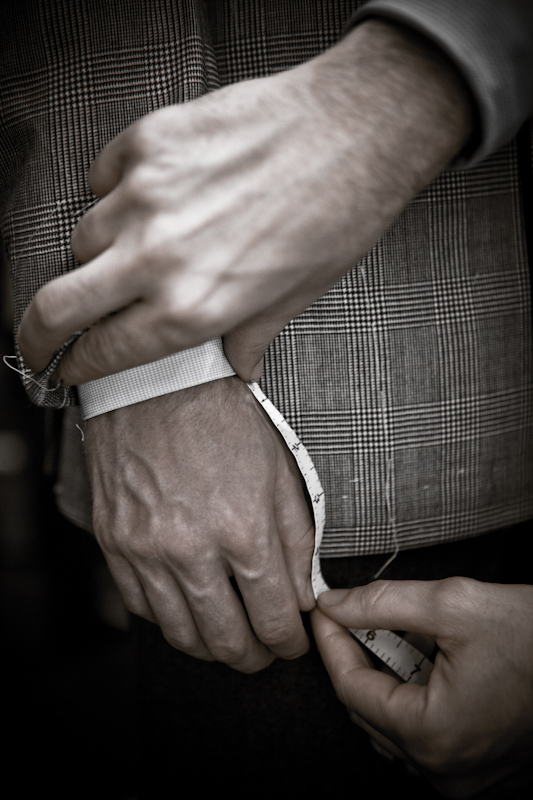 The right sleeve will be lengthened a half inch as well, after which we should be ready for a final fitting next week. 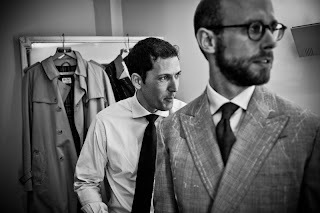 You can follow the discussion on Prince of Wales at Henry Poole: Part 7 by entering your email address in the box below. You will then receive an email every time a new comment is added. These will also contain a link to a page where you can stop the alerts, and remove all of your related data from the site. Great suit. I like a high gorge on a DB. 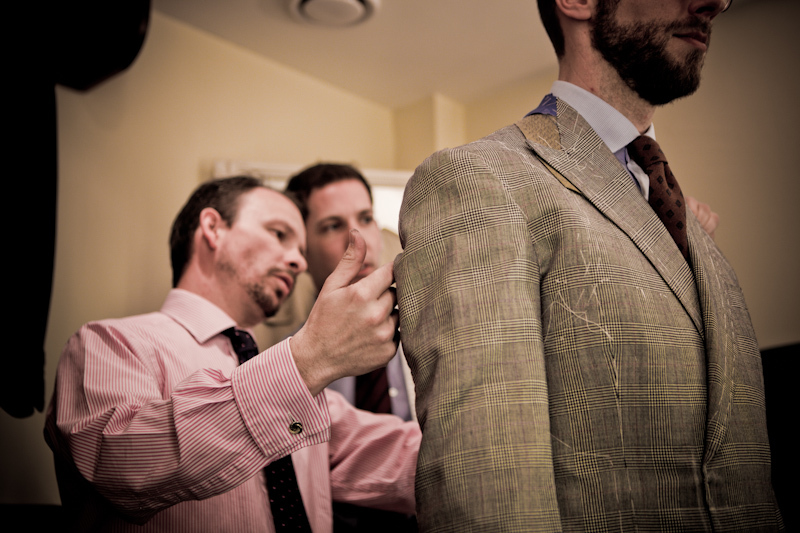 Is this the standard gorge for Henry Poole or did you request it? Standard gorge. Pretty much as high as it can be without lifting off the chest, which is a look I hate. It’s all bunched up under your right arm. Yes, the armholes are being lowered slightly and the chest cleared a little more to deal with that.